From my visit to their Hawthorne location with the big tent on the corner for even-in-the-rain outdoor dining, that could be a truly great idea. 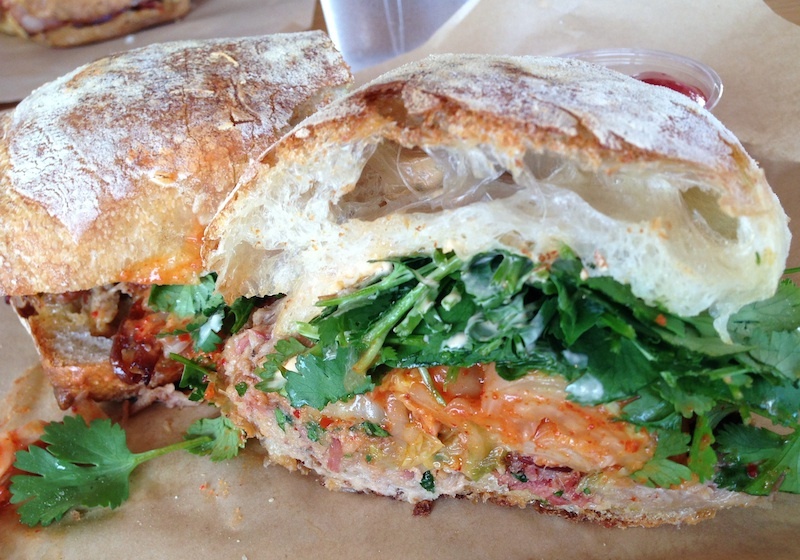 My pork meatball banh mi, with its juicy ground pork balls and vinegar-and-fish-sauce-infused veggies topped by cilantro was a pile of porkyliciousness, and the smoked coppa cubano was a big mouthful of hell yes. 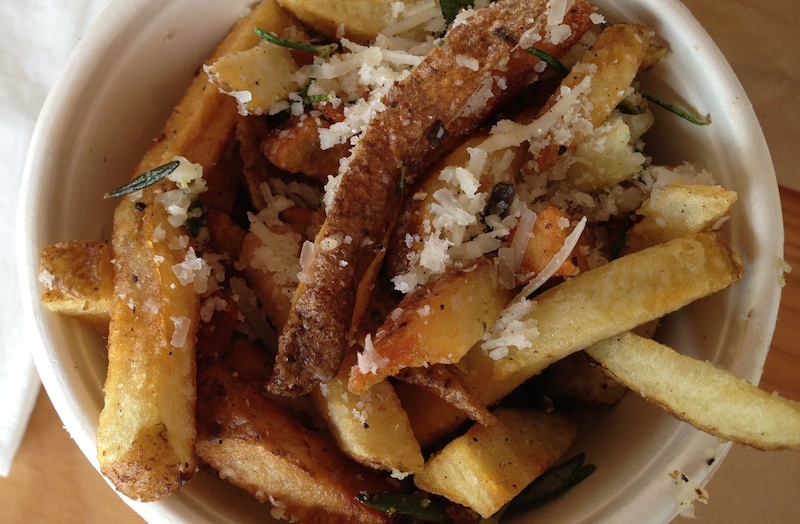 Fries tossed with herbs and parmesan were of the could-be-crisper but perfectly decent persuasion. And prices were in the low to moderate range, meaning right around ten bucks for lunch (without beer). For the quality you're getting, that's a steal. 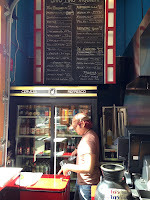 Details: Lardo Eastside, 1212 SE Hawthorne. 503-234-7786. 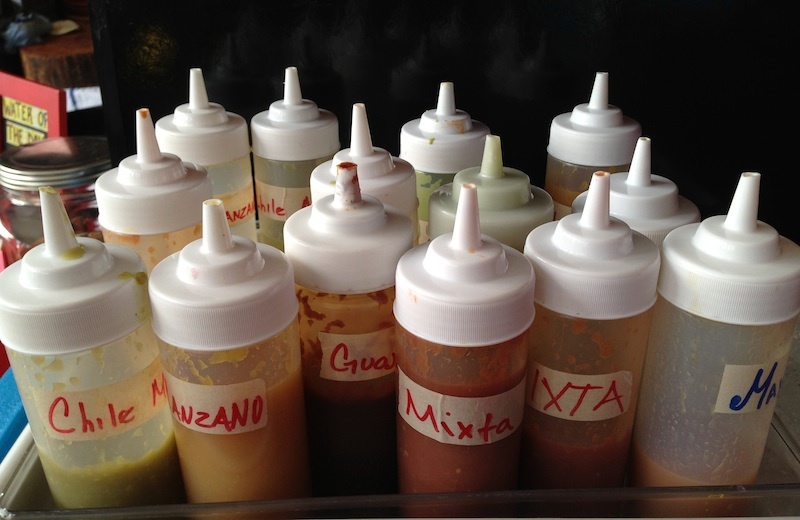 Tacos, to me, are the perfect street food, best consumed standing up outside where the juices and, occasionally, some of the contents can trickle onto the ground. Ideally, that would be on a sandy beach in Mexico or from a market stand in the city with people and scooters hustling by loaded down with what will become the day's meals. Here in Portland we have to take into account what the rain would do to those tacos, so we must compromise on the outdoor aspect on occasion. But the bright, cheery interior of Uno Mas makes that a pleasure, especially with the handmade corn tortillas and authentic fillings and sauces of Oswaldo Bibiano's latest Mexican eatery. Cheap at $2 each for the "tradicional" (meat) and "vegetal" (veg/cheese) versions and $3.75 for the seafood-laden, these little flavor bombs are priced to mix and match at will. 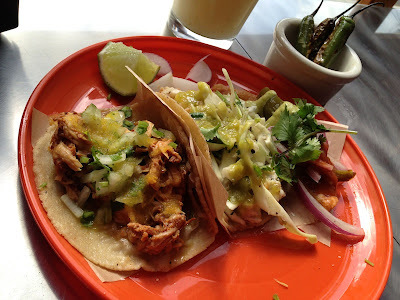 There are also steamed tacos, which I'd never had, small tortillas filled, folded in half, then steamed, that were kind of like mini pupusas. Bibiano himself was in there the day I visited, looking happy with his new baby. As well he should. 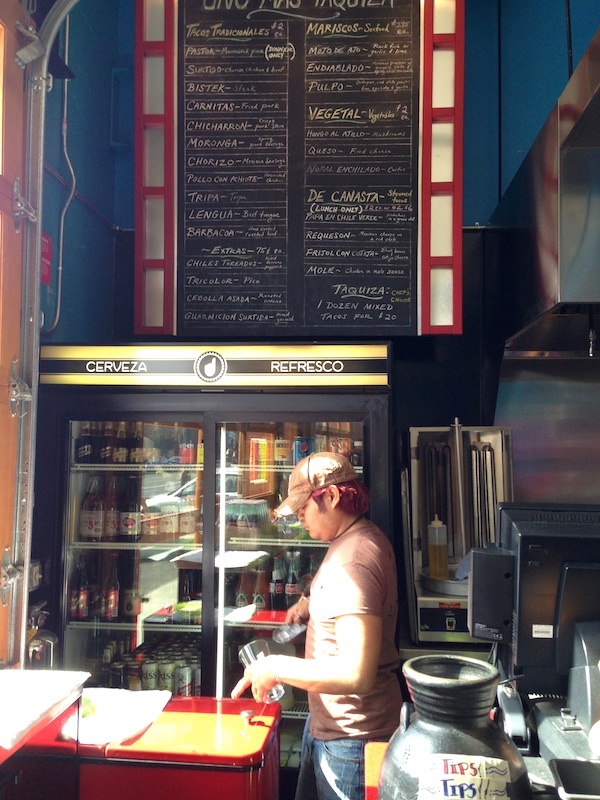 Details: Uno Mas Taquiza, 2337 NE Glisan St. 503-208-2764. One of the absolute best perks of being a writer is the opportunity to meet and get to know people I might never have had the chance to talk to in my normal life. 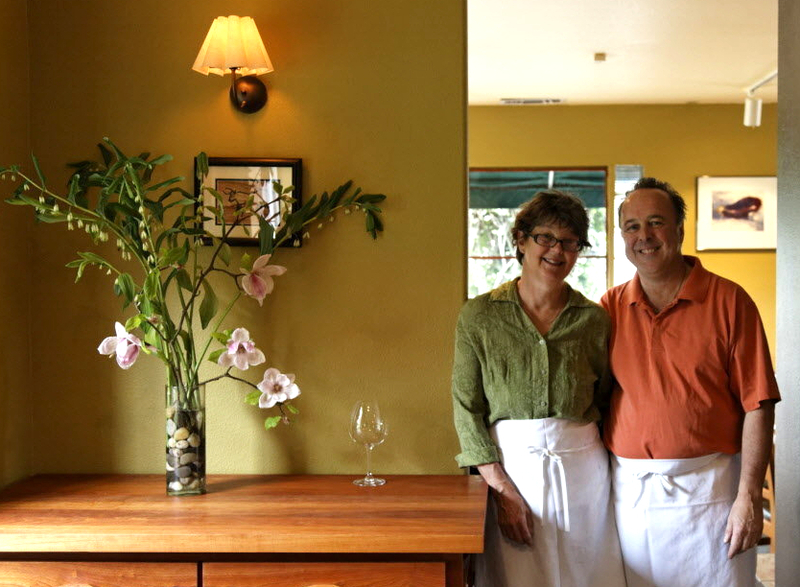 One of those was an interview with Tina and David Bergen (below left) owners of the landmark restaurant Tina's in Dundee, for last year's spring wine guide in the Oregonian. 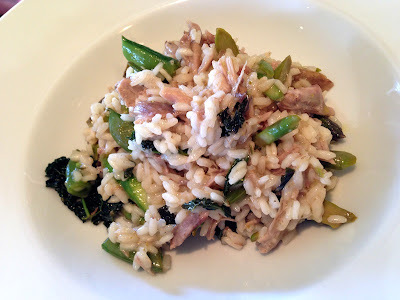 So when a friend suggested a field trip out to wine country for lunch and tastings, I hinted that it might be fun to stop at Tina's to check out their spring menu. Lovely and warm but unpretentious, it has to be one of my favorite outside-of-Portland spots, with a dedication to local ingredients—and by local I mean within a mile or two—and letting those ingredients speak for themselves rather than be drowned out by execution. 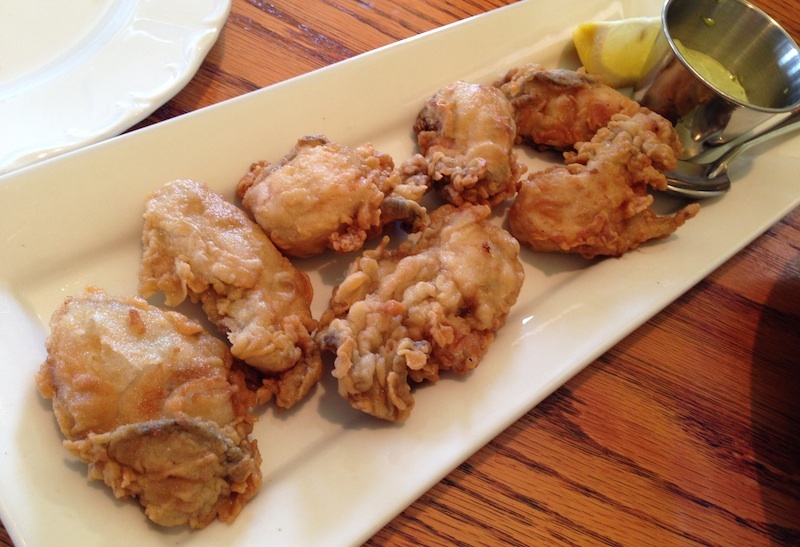 For example, the fried oysters (right) were simply battered and briefly fried, leaving their fresh brininess still intact, and with a light sorrel mayonnaise that accented, rather than buried, their sweetness. The day's spring pea soup was like tasting a pea shelled right in the garden, and the risotto with asparagus and duck confit was probably one of the best risottos I've ever had, period. Prices, as you might expect, aren't cheap, but for a special day out in the country in spring, you won't find better, more beautifully prepared ingredients anywhere, or more lovely people. Details: Tina's, 760 Hwy 99W, Dundee. 503-538-8880. Photo of David and Tina Bergen by Beth Nakamura for the Oregonian.